In the present work, analytical method for the determination of trace elements in adipose tissue by means of inductively coupled plasma optical emission spectrometry (ICP-OES) was developed. Adipose tissue from two groups of the patients with obesity (with and without metabolic syndrome) was investigated. 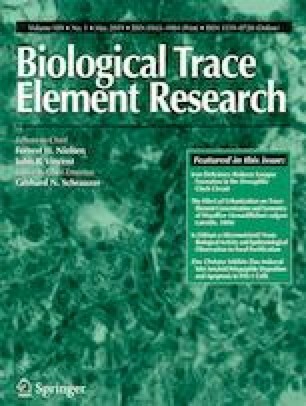 The main aim of this study was to reveal some differences and regularities in concentrations of trace elements in adipose tissue between these two groups of the individuals. Moreover, different types of adipose tissue (subcutaneous, preperitoneal, and visceral) were analyzed separately in order to investigate distribution of metals between these types in different groups of obese people. Al, Ba, Ca, Co, Cu, Cr, Fe, K, Li, Mg, Mn, Na, Ni, Sr, and Zn were selected for the quantitative determination. However, only 6 elements (Na, K, Ca, Fe, Mg, and Zn) were determined in all analyzed samples independently of the type of adipose tissue and presence of metabolic disorder of the patient. Concentrations of Ca, Fe, K, and Na were found to be strongly dependent on the type of adipose tissue. Other elements in terms of detection frequency in adipose tissue samples can be arranged in the following sequence Sr (94.7%), Cr (86.2%), Cu (24.6%), Li (18%), Ba (1.8%), Co (0.05%). The concentrations of Al, Mn, and Ni were found to be lower than limit of detection (LOD) in all analyzed samples. Comparison of metal distribution depending on the type of adipose tissue of people with and without metabolic syndrome is discussed in this work. This work was supported by a grant SEMAT (No. SEN-02/2016) of National Research Programme “Healthy ageing” from the Research Council of Lithuania.